Item response theory (IRT) is used to evaluate the relationship between a latent trait, such as mathematical ability, quality of life, or patient satisfaction, and the test questions or items intended to measure that trait. IRT is especially useful when developing new instruments, when analyzing and scoring data collected from these instruments, and when comparing instruments that measure the same trait. A Course in Item Response Theory and Modeling with Stata, by Tenko Raykov and George A. Marcoulides, is a comprehensive introduction to the concepts of IRT that includes numerous examples using Stata's powerful suite of IRT commands. The authors' development of IRT builds on the foundations of classical test theory, nonlinear factor analysis, and generalized linear models. Using these foundational concepts, the authors then explain IRT models, estimation via maximum likelihood, item characteristic curves, and information functions. The examples demonstrate how to fit many kinds of IRT models, including one-, two-, and three-parameter logistic models for binary items as well as nominal, ordinal, and hybrid models for polytomous items. In addition, the authors provide overviews of instrument construction and differential item functioning. 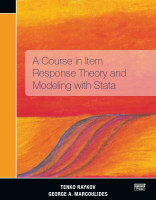 A Course in Item Response Theory and Modeling with Stata is an outstanding text both for those who are new to IRT and for those who are familiar with IRT but are new to fitting these models in Stata. It is a useful text for IRT courses and a good resource for researchers who use IRT.